Like Christmas, Easter can readily be drawn on as a standard to measure the large world events of the day. The story of Jesus' last week in Jerusalem gives full weight to the deepest human themes: life and death, love and hatred, constancy and betrayal, courage and cowardice, hope and despair, freedom and tyranny. The variations on these are played on our personal lives and on the affairs of nation and world. This year Easter coincides with the fifth anniversary of Pope Francis' election. Anniversaries are also times for assessment and measurement. Francis' anniversary has led many to comment on the successes and failures of his papacy. Easter is a doubly appropriate time to reflect on whether the commentators have weighed in correctly. In my judgment Francis has been effective in commending through his behaviour and relationships a simple church, fraternal rather than paternal in its relationships, local as well as universal, compassionate, focused on mission to the world more than on maintenance, passionate in its wonder at the dignity of each human life and resolute in its defence in the face of brutality, inequality and carelessness, and above all joyful and trusting rather than burdened by the gift of faith. Questions remain, particularly about his response to the sexual abuse of children and its cover up and also to the exclusion of women from positions of leadership. That is one person's judgment which we could debate forever if we abandoned ourselves to it. A more penetrating question, though, is what we make of Francis' perceived successes and particularly of his failures. We all tend to minimise the successes of people we do not like and to deny the failures of those we do. Underestimating popes' failures does not matter much. But for Catholics to deny failure in popes is a dangerous temptation. It risks making popes puppets of our own expectations of perfection. That is where Easter comes in. It is not a time for heroes. It represents the church as a bunch of frightened men, leavened by a few courageous women, confronted with the death of a great dream in the tortured execution of their leader who is abandoned by God and his followers, their own sense of themselves destroyed by their betrayal and flight, their organisation in tatters and headless, held together momentarily by fear of leaving town. "The worst thing we can do to a pope is to deny his faults, blindnesses and mistakes as if they made him less as a Christian or pope." They then find to their joy that their leader and their dream are alive and that they, flight, betrayal and all, are the tinder for a great blaze, bound together by their joy and the mission to the world. They too are sinners on whom God has had mercy, gathering together other sinners on whom God has also had mercy, to live out of the joy of it all. That is why the worst thing we can do to a pope is to deny his faults, blindnesses and mistakes as if they made him less as a Christian or pope. We may question whether the failures attributed to him are really failures. That is a matter of judgment on which nothing important hangs. At a deeper level, however, for a pope, failure is a badge of honour. The Peter whom he represents lurches from one mistake, misunderstanding and false move to another, but is always welcomed back by Jesus. He is the paradigm of Easter. Francis himself echoes Peter in identifying himself as a sinner on whom Christ had taken compassion and called. The failures which he acknowledges in himself as a sinner called to follow Jesus in mercy are central to his understanding of himself as Pope. They place him precisely in the story of Easter with its recognition that betrayal, denial and failure are the paper and woodchips that light the fire of joy in Christ's rising. That is why the evaluation of Francis' success or failure as a Pope becomes a diverting game. It can safely be played only as long as we recognise that Easter subverts the criteria by which we judge success and failure. Easter is the twilight of meeting expectations, of measuring up, of outcomes and of corporate plans. It is the dawn of life, of forgiveness, of compassion, of hope, and in a word, of humanity. There is much Christian faith and charity in this writing. The true meaning of Easter shines through. Jesus showed that the most vulnerable person who has been a stranger, subject to exclusion and vilified can forgive. Jesus is more than a symbolic figure though. As well as an exemplar of discipleship, he is also prophet and high priest. We all share successes and failures and no one should be judged on the ratio. In regards to the sexual abuse of children and the exclusion of women from positions of leadership it is not only one person who is deeply affected. It is all those who actually have been sexually abused and those who actually are excluded from positions of leadership. Their abuse and their exclusion are part of their discipleship, part of their relationship to our high priest. Thank you Andrew for this piece. I looked for some theological reflection in the Age this morning Good Friday but alas other than reporting the primary trial re George Pell the paper was silent on the significance of the day for millions of Christians in this country but full frontal on sport. Ross Gittens was correct earlier in the week questioning where our morality and impartiality stands not only in the media but wider community. Andrew I like your writing, but it seems to me it tends to say: carry on as usual because sin and error are innate in the human person. Easter is about the renewal of life's limitations so I prefer to view the cross of Christ as a moment of recognition (centurion's cry) that we are called to change and transcend our sins through atonement. That means constant renewal of mind and heart of which Pope Francis shows little action when it comes to empowering women (as Jesus did) and seeing the world through the eyes of a child (as Jesus taught). CANON LAW MUST BE CHANGED NOW: to remove the code of secrecy and demand mandatory reporting of offending priests against children. Archbishop Wilson told the Royal Commission that bishops defer all personal responsibility to the Vatican's formal policy of secrecy to avoid scandal. The Pope may be only a symbol as head of an organization but as head he must hold Christ's image at the center rather than the ecclesial organization. Thank you, Andy; a Happy Easter to All who partake of the offerings at Eureka Street! Andrew, Easter is indeed a time to reflect on commentators' correctness. Metaphor suffused Jesus' teachings. Consider your ironic howler "church leavened (sic) by a few courageous women". The patristic post Constantine church used that to connote sin, woman as its originator and frequently the Occasion of men's vilest sins. To diminish women, male clerics created their great calumny against one of the greatest disciples, Mary of Magdala, one of the three women ordained directly by God's angel as the first preachers of the Resurrection of their Lord. The ancient liturgical trope QUEM QUAERITIS was recited antiphonally at Easter and Corpus Christi. It ends with the angel's ITE NUNCIATE QUIA SURREXIT DE SEPULCHRO. I write this at dawn on Sunday, "tertia dies". Ya wanna see leaven? Hot Cross Buns. Read the Ingredients list on the packets that hit our shops in early January, cashing in on His crucifixion before the infant Jesus hits Epiphany. ". . . yeast". The best known leaven, at Passover already! All part of Christians' insouciant mockery of Jesus as Jew; the leaven in Easter bellies and hearts of ignorance and indifference to the Faith of the man. You wouldn't find that on the table of Jesus' last Seder, or in the spirit of His new commandment, the Mandatum Novum, "le Mandat" & "Mande" to Normans, whence "The Maundy" & Maundy Thursday to us, who've for over 1000 years persecuted Christ in the persons of His fellow Jews. Andrew's reflection accurately describes the reality of the Pope's position. He is not an absolute authority , as may have been the case in earlier papacies . My suspicion is that the Roman Curia, bastion of orthodoxy and secrecy still holds very considerable power in the Vatican. there are a large number of conservative Cardinals , particularly from Africa who oppose change at all costs. The more liberal Cardinals from the western cultures of Europe and the United States do not have the numbers to initiate change. Clericalism is very much alive and well. Until educated lay people, particularly theologians take an more assertive role to ensure Clergy are servants of the Church, not its masters with a humble approach to ministry, then nothing will change . I have read several books dealing with the sexual abuse crisis in Ireland , the U.S and Canada . I am inclined to believe it will take the demise of the current generation of Catholics; that is at least a century, before major changes will commence in the Church relating to abuse of children, women and the admission of women to positions of authority. Francis is to be commended on his work so far. A Happy and Holy Easter to all. @ Trish Martin: CANON LAW MUST BE CHANGED NOW.........There will always be sin because of our fallen human nature. But spiritual corruption as in to pervert the course of justice in regards to the protection of innocence is in a different league. In the Old Testament, God spoke against those who operated in their own authority while abusing the very people they were to bless. We have seen and see men of power within the church misusing that power and often deflecting their responsibility to protect innocence, by referring to their obedience, to Canon Law. It could be said that Canon Law is comparable to the term used for corporate responsibility as in ‘A Controlling Mind,’ as this term is used when directors of corporate companies are called to account for their dictates that have caused civil or criminal law to be breached, resulting in a claim against the corporation. One really has to wonder what sort of ‘Controlling Mind’ controls the church; it is certainly not the ‘Mind of Jesus Christ’....“The Pope may be only a symbol as head of an organization but as head he must hold Christ's image at the centre rather than the ecclesial organization”…. and in doing so, reflect the ‘Controlling/guiding Mind’ of Jesus Christ. “The Peter whom he represents lurches from one mistake, misunderstanding and false move to another, ….” That was the Peter before Pentecost. The Pope represents the one after. If the two are the same, the drama of the downloading of the Holy Spirit would have been cheap special effects. There is evidence from Scripture of a false move, and one only, by ‘Pope’ Peter, his vacillation about circumcision for Christians, for which he was held to account by Paul. 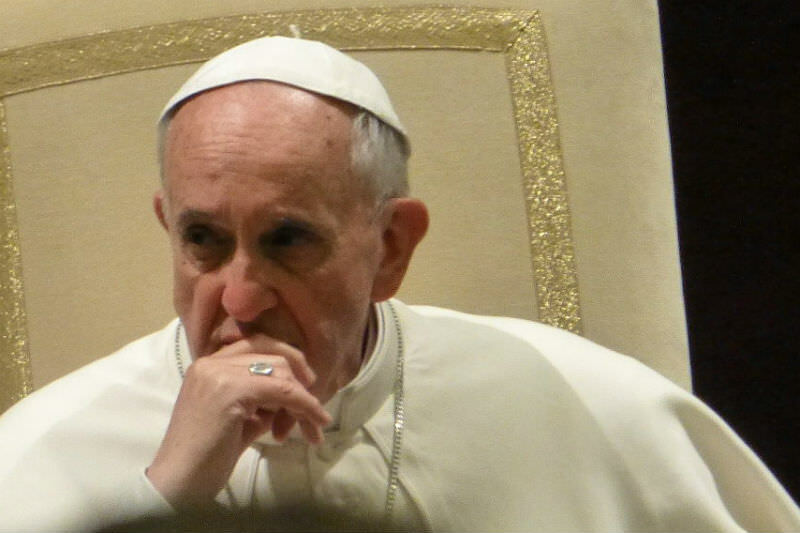 This incident could possibly have been a divine foresight to furnish the necessary precedent for the action of the four cardinals in holding Pope Francis to account over Amoris Laetitia. But the Peter-Paul matter aside, there is nothing in Scripture to suggest that popes are allowed to make mistakes, if only because a pope is also the vicar of Christ. If ordinary Christians are, according to Scripture, ambassadors of Christ, and should behave as such, surely it must behove a Vicar of Christ, more a regent than an ambassador in the things that must be rendered to God, to go out of his way not to give an impression of lack of rigour in what he says or does. Thank you for the poetry of your words, Fr Andy. What meditative theatre! I would like to gently respond to Roy's comment. There is a battle, a good fight, for the crown of righteousness St Paul spoke of. The need to have a strong stoic leader of our own is particularly strong for those of us from families whose faith in Jesus has led to suffering. People may seek such external leadership from any number of the majority of countries which do not have adequate protections for religious freedom. The image of the strong protective warrior-God could evoke comforting feelings for such people, as in Isaiah 41. The Pope may well be in battle: let me reconfigure the signs by which leadership is understood to succeed. Perhaps the little child would say when Mum is smiling. and Dad is considering their needs, in community with supportive adults and families.